Everyone loves bowling. The sport can provide hours of entertainment for virtually everyone. 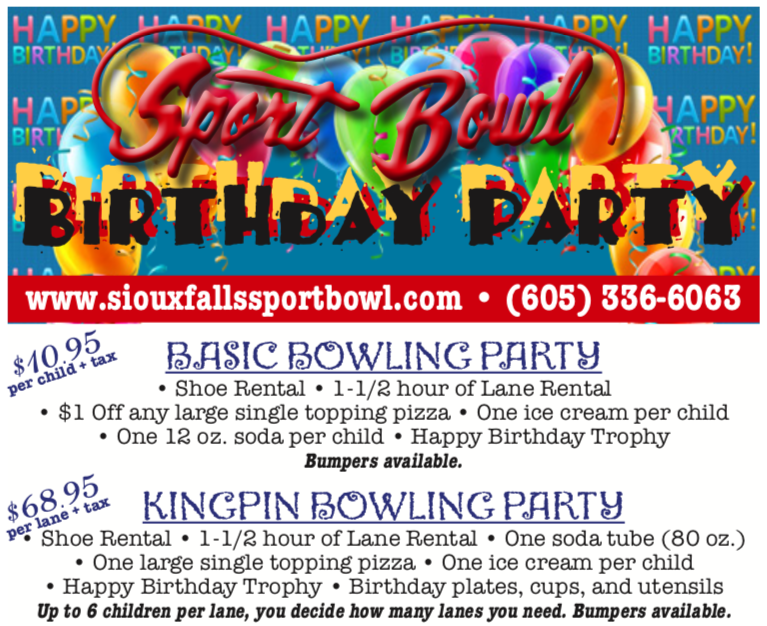 So host your next birthday party, church group, fundraising activity, corporate outing or other event at Sport Bowl! Our center features 24 lanes, a restaurant, bar, billiards tables and arcade games. Parties and groups can utilize one or both of our 159″ projection screens for music videos, presentations, slideshows and more. Contact us to book your party or event today! We have two packages available for your child’s birthday party celebration. Download the birthday party reservation form to learn more and get started. Host your next church group, fundraising activity, corporate outing or other event at Sport Bowl. We have two 159″ TV projection screens that are great for music videos, slideshows, PowerPoint presentations and other multimedia uses. Bowling is a great group activity that everyone can enjoy. Enjoy a cold drink and food from the grill as you mingle with friends and colleagues.